"Yuk, kitna ganda hai yeh station. You know the Chicago suburb Railway station is so clean and beautiful".Heard a lady in her mid twenties telling her companion in Pune station. The dissatisfaction was quite evident in her voice and along with it the widened nostrils, which Congress spokes person Jayanthi Natrajan would be proud to have, was just adding the crown to her already over sized grievance against Mamta Banarjee and team. Being seen the Chicago station myself, I could easily co-relate the difference the lady was trying to point out through her nostrils. Just when I was starting to appreciate the lady for her concerns and the widened nostrils, there she goes. She nonchalantly threw the Bhel-Puri plate right there on her feet and went hurriedly to fetch a cup of Tea. Goodness gracious.Does she expects Mamta Banarjee to come and pick that up and set the place straight before she returns back with her cup of tea, so that she doesn't have to widen her already widened nostrils further?As I myself got too busy catching my train, I couldn't notice what the lady did with the Tea cup and going on to blame whom to which extent. But the lady's nostrils made two points clear. First : There is tons and tons of gandagi around us in our country. Second : We as a country are full of entities, who at the best can provide lip service and go on blaming the authorities for all the filth, where in we ourselves are individual contributors to this dirt, but start shouting from the roof top at the drop of a hat. By nature we are pigs when it comes to cleanliness, hang-on: or is it our national character ? I guess the later. When I was being driven down from the Airport on return from my first foreign trip from US, the evergreen Taxi driver from Amchi Mumbai started a conversation with me on my trip and my experience in US and all. After few rounds of rapid fire, he glanced at my hand and asked 'yeh kya hai sahab'. A key ring I replied. 'Kya Sahab. Ek Nanga-Punga boy doing susu. Yeh kyesa key ring hai sahab. Let me pass on some wisdom to this chap, I thought. This is called Mannekin Pis (A statue), a famous tourist spot in Brussels. The way we make small souvenirs of Taj Mahal to carry back home as memorabilia. This key ring is just a small souvenir of sort, I explained. Taj mahal jyesa famous. Tourist ate hain wahan aur Photo bhi khich te hain ? Asked the driver. I could easily see the dis-believe and non-appreciation in his wide opened eyes on the very fact that statue of a boy doing susu could be a tourist attraction. I don't blame the driver. In fact average Indians won't believe that statue of a so called Nanga-Punga boy doing pee-pee, could be a tourist attraction, as day-in day-out we see thousands of our fellow countrymen doing the same act in open air, near bus stand, on the side of a busy street, on the walls of government offices (I heard, at times even private properties are not been spared), for years and years. Do you think anyone would make a statue of us doing the act and name it as Bharatiya Pis and tourist from across the globe would come taking pictures and souvenirs. Worse even that the authorities rather being exited and proud of our act, threaten us with fines for doing it in open air. My thoughts were interrupted, when the driver told me on how once he was caught red handed by a policeman while committing this act on the wall of the City museum and how he managed to get away from paying a fine of Rs.300/- by offering a bribe of 20 bucks to the police man. It is well said that, if you want to see India, then start with Indian villages, but I would say start from any government office that you find. No ifs and buts, just any govt. office full with lazy babus would do. Even if it is not a very exiting way of discovering India, but surely it's exiting to see how oblivious we are when it comes to cleanliness. I was once unfortunate enough to go to the local Municipality office to pay the property tax. After numerous efforts and quizzing a dozen not so friendly govt officials I managed to get to a corner, only to be greeted by a huge line against the sole counter reserved for property tax paying. The Mayawati look alike lady behind the counter was in no mood to attend the long queue of patrons in a hurry. Suddenly Mayawati ji got the feeling that it's lunch time. Without appreciating our patience to stand in a queue (Which is completely non-Indian), Mayawati ji opened her lunch box to honor the content inside it. Was it Aloo Muttor and Paratha in the menu? As I was waiting for Mayawati ji to finish her lunch, I realized I am actually in the middle of a huge dustbin. I asked the gentleman infront of me about the average time Mayawati ji taking to clear out an individual. 'Yak..Thoo' and there goes the fountain of at least half a liter saffron colour mixture and splashed on the face of Amitab Bachhan, who was advocating about getting all children polio vaccinated, with writing on the wall "Ek Bund Jindegi ka". Lunch ke baad, paan ek chahiye achhi digestion keliye, said the gentleman before answering my query. Of course it's needed , I affirmed. How much AB would agree to this medicinal value of paan, whose face had gone beyond recognition, except the trademark white color french beard spared from this tsunami of saliva, is to be seen. The artwork of the gentleman in front left AB look more like a Choco-bar Ice cream: Saffron at the top and white below. The gentleman in front and many others alike have left no stones unturned in making that small room look artistic. All the small patches all around was giving the room a cynic look, least to say. 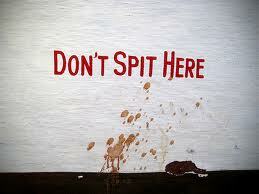 This Paan and lately the new entrant on the fray, better known as Gutka are rapidly becoming a national causality. Anywhere you go North, South, West, Bottom of Arabian Sea, Top of Mount Everest, you would always find the trail of either these two entities or both. You go for an early morning walk to inhale a bout of fresh air, you will be disappointed with your decision. If you have travelled in sleeper class of Indian Railways, then I don't think I required to narrate further on our sense of cleanliness. Just by widening our nostrils, doesn't make this country a cleanlier place. Not only in India, but we carry our special attribute of meshing around as filthiness is always part of our packing, wherever we go, to any part of the world. This is the reason, I wasn't at all surprised when I read a news under the header 'Indians Abroad', that two men of Indian origin were apprehended by Police in Brussels for being engaged in a three way peeing contest with a local tourist attraction.